Disclosure: Ben and I received a complementary entries in exchange for blogging about the Newport 10K before the race and to post about our experience. Newport 10K was my first 10K. I did it back in 2012, before I even had a blog. I was just starting to learn about racing. It’s one of Ben’s favorite races, so when we first started dating Ben couldn’t wait to introduce Newport 10K to me. Until a couple months ago, we lived right at the border of Hoboken and Jersey City, so the start/finish line was a few blocks away from our building. In fact, the route goes right past our building. 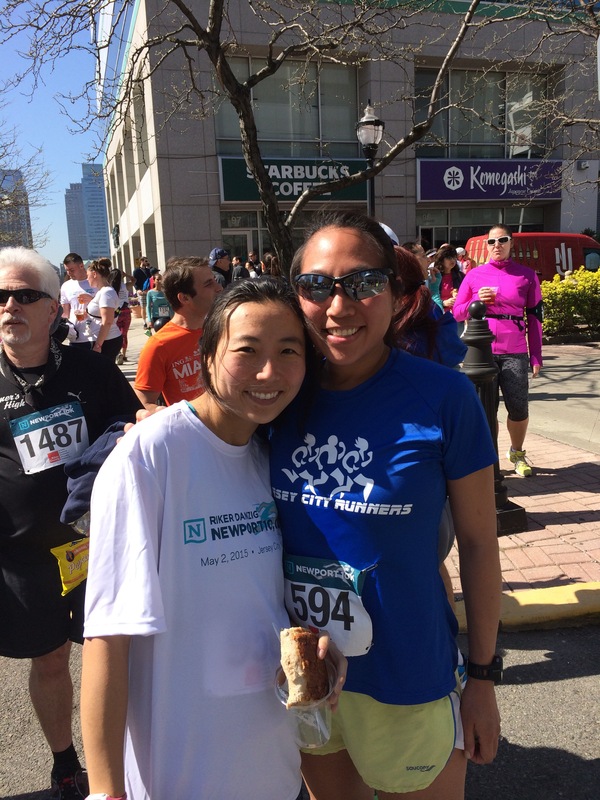 With all our running friends in Jersey City come out for this race and the great post-race atmosphere, when we were given an invitation to come to Newport 10K from the organizers, Ben and I hopped right to it. Bright and early, somewhat bleary-eyed, we woke up in Brooklyn to cross two rivers, an island, and a state line to run the Newport 10K in New Jersey. Packet pick up was a snap. In under a half hour, we had parked, walked over, picked up our bibs and shirt, went to the restroom, and got into our corrals. Even with the largest number of runners ever at the race, somehow every year without fail, we always manage to find our friends before the race starts even though we don’t make any formal plans. There’s no formal corrals, just signs with paces and you line yourself accordingly. There are tons of people, but by milling about, we run into our old running group. I was really happy to see Nell. She gave birth last December. She’s always been a slightly faster runner than me, but during her pregnancy I enjoyed a few short months at the end of her pregnancy where I was faster than her. I asked her how fast she planned on going on. She responded, “Oh, 8:30. Something slow. 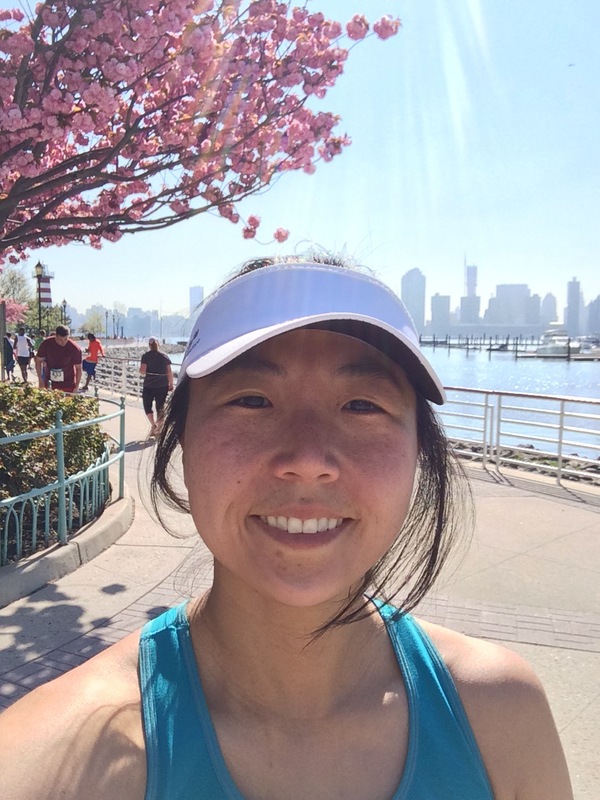 I’m not in shape.” I was happy to hear it because that was about the pace that I wanted to run since I hadn’t been able to run much the last couple of months (and pretty much nothing the last few weeks). So I said that I would run with her. Nell is a good person to run with (if you can keep up with her) because she runs very even paces. Let me get this out of the way first. Nell is THE BIGGEST SANDBAGGER I KNOW (I still love you, Nell, but it’s true. And if you readers think I’m mad at her, I’m not. I’m just teasing.). We started off together and Nell offered to do the pacing. The first mile was a 7:52 pace. The second mile, I don’t know how fast she went, because she dropped me like a hot potato (something I told her repeatedly when I found her at at the finish line). I think I stuck with her for .2 of the second mile and then I helplessly watched her pull away from me in a sea of runners. As I ran by myself, I shook my head because a lady who recently gave birth was running much much much faster than me. The first two miles of the Newport 10K is really nothing to write home about. The start line is right in front of the PATH station and winds around the industrial bleak part of Jersey City. I love Mile 3 when we run by Hamilton Park because of the pretty streets. The late winter meant that cherry blossoms bloomed later this year, so they were still out in full force. The beautiful brownstones and the residential streets lined with cherry blossoms makes this one of the nicest sections of the race. Unfortunately I got a terrible sideache at that portion, so I had to slow down. Then there’s another short boring industrial section, before we race along the streets of Jersey City. I recovered from my sideache around Mile 5, so I sped up again. A part of the 10K course overlaps with the Newport Liberty Half in the fall, so it’s always fun to run on those streets and think about past Newport Liberty Half races. The last 1.2 miles is my favorite part and not because it’s the last section. It runs right along the Newport/Jersey City waterfront which was OUR running route when we lived in Hoboken. Whenever I’m running on that waterfront in a race, I feel a surge of energy and think, “This is MY route. This is home field advantage.” I know every turn. Right at Mile 6, Ben was waiting for me and cheered. I ran on to the finish line. My final time was 51:42; three mins slower than the PR that I set last year in March, but honestly I put in a good effort. It was as good a race as I could run given the shape that I’m in, so I’m happy. Ben also had a good race for also the shape that he was in. Nell, well, she raced to a 48:42. In less than 6 months after she gave birth, she’s already back to 90% of her prior fitness level before she got pregnant. She’s a marvel. Of course, I raced with my usual gear – Headsweats visor (a must for me to keep the sweat off my face and shade my eyes), Simple Hydration bottle (no waterboarding for me! And I get to skip the congestion at the water stations), Spibelt (to hold keys, IPhone, and SH bottle), and Garmin (need my splits!). After the race, we got our free beer (I gave mine to Ben), ate our bagels and bananas, and hung out in the Newport Square. It’s was great listening to the live band (a first!) and catching up with everyone. Afterward, we went to one of our friend’s place to BBQ. It was a great fun day. Racing and BBQ with friends. Life is pretty good in NJ. What is it with fast people? Who just had a baby!? Ugh! I know! It’s like she’s an alien or something. Great job!! Your friend is a real inspiration, too! She is amazing. One of the many talented runners I know. I was glad that I ran into her at the start of the race because she inadvertently forced me into running harder than I would have otherwise. Nice run! And your friend is amazing, too! Thanks for the compliment and for reading this. My running coach is the same way. She was running half marathons 8 months pregnant faster than I do now. Crazy!!! Sometimes I think they’re not mortal. She’s a great strong runner. I miss running with her.